Feeling Adventurous? 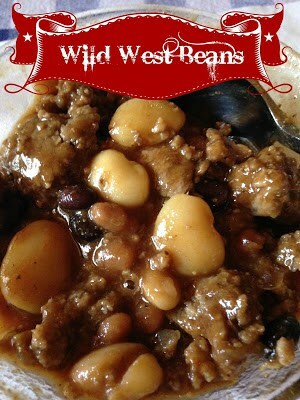 Wild West Beans are the answer. For that true Cowboy Experience make wild west beans in a cast iron, Dutch oven, over an open fire. You’ll be singing, “Home, Home on the Range” in no time. Don’t have a cast iron, Dutch oven or an open fire? No problem…make these delicious beans in your oven or even in a crock-pot. 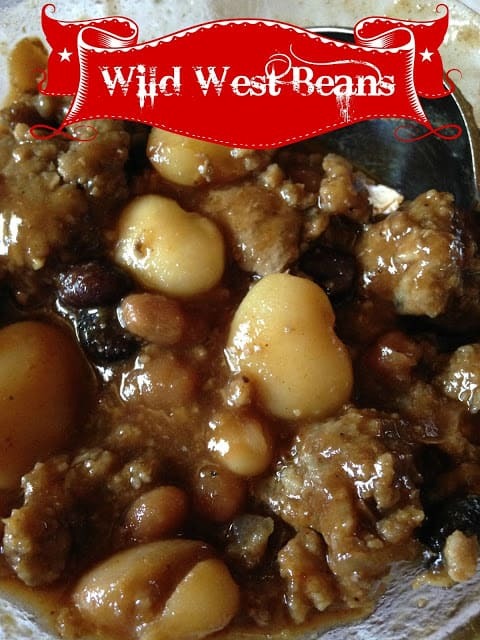 “Wild West Beans” are sometimes called “Calico Beans.” We have shared many “bean”recipes here on Turnips 2 Tangerines and this is one of my favorites. Made with ground beef, cans of pork n’ beans, bacon, honey bbq sauce, kidney beans, black beans, butter beans and anything else you like. In a large skillet, brown beef and bacon over medium heat, add onion and cook until tender 10 minutes, remove from heat. Transfer beef mixture to a 5-quart dutch oven. Add all remaining ingredients, mix thoroughly. Cover and bake at 350 for 1 hour and 30 minutes or until heated through.